I’ve been looking for a chance to get away for a long weekend. You know, no work and no computers. This weekend was better than any, considering my upcoming work schedule that will remain busy up until the end of the year. So plans were set to revisit Solvang and a quick visit to Los Angeles on the way back. Solvang is located about 35 miles north of Santa Barbara. Perhaps it was the wine had during the first visit but I didn’t remember it being quite the Danish tourist trap as last time. The next day on the way back to San Diego, there were several must-visits: Porto’s for several helpings of potato balls, a teashop, comic shops and cupcakes. I would be lying if I said that every major meal in Los Angeles did not involve a stop to Porto’s for potato balls. The reason? I never did crack the potato ball recipe at home. The other food musts before leaving were cupcakes. Frankly, with the cooler weather and such, I’m so over the froyo craze. It has invaded San Diego. On the other hand, cupcakes never did make it down south. Rather than revisiting Sprinkles, Yummy Cupcakes, My Little Cupcake, Auntie Em’s or Susie Cakes, I did want to try a new shop. 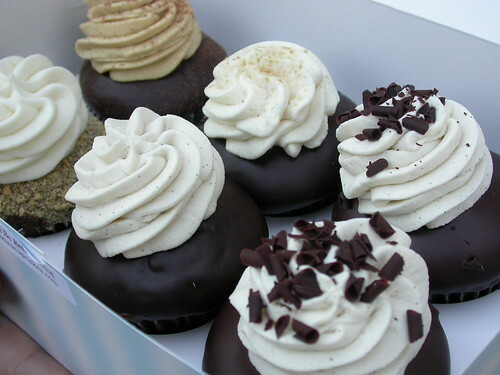 Dainties was named in the August edition of Los Angeles Magazine as the best cupcake shop in the city. Due to that high recommendation, I had to visit. 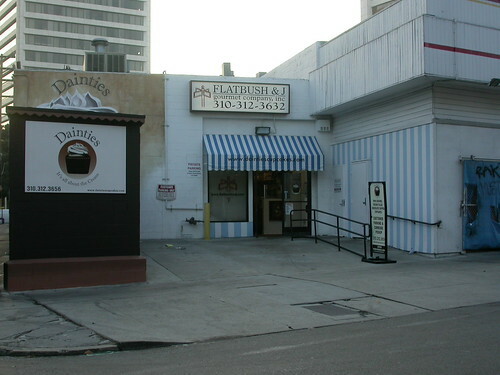 Dainties is located in an unglamous part of Santa Monica Boulevard behind a Winchell’s Donuts. To call it a shop would be a stretch. The place shares the space with a catering business. 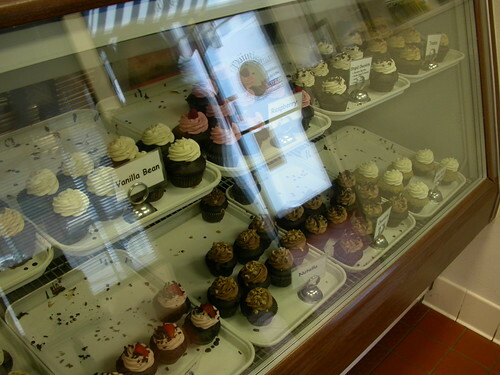 But cupcakes are on display with several different varieties. On this visit were Nutella, strawberry, raspberry, cheesecake, tiramisu, vanilla bean, Vermont maple and a flavor called Stupid Chocolate. The Stupid Chocolate is a combination of the devil’s food cake with chocolate chips folded into the batter, a chocolate ganache enveloping the cap the of cake, a plain whipped cream topped with chocolate shavings. If it reminds you of a Hostess product, it’s mighty similiar but far superior. The differences among the other cupcakes available were the cream. The Vermont maple cupcake has a slight flavoring of maple in the cream. The same thing goes for Vanilla bean: vanilla specks in the cream. Another note about the cream, all cupcakes had a dollop squeezed into the center. 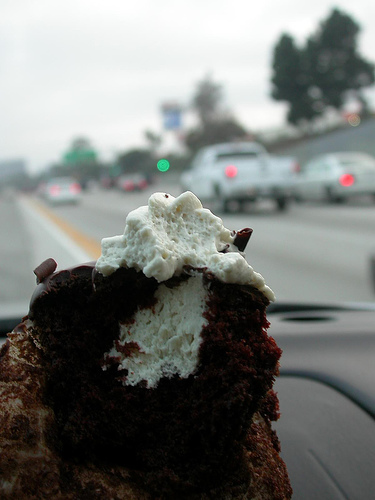 Nope, it’s not about the frosting, it’s all about the cream. Cupcakes are $3 each and I hear that a vanilla-batter cupcake is only available on Saturdays. As for comic shops, it was a just a routine visit. They seem to remember me, especially Paul since many of them stock his book. 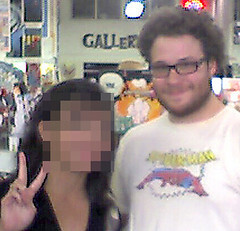 But there was a chance encounter with a celebrity: Seth Rogen! Let it be known that I’ve had many encounters with celebs during my one year adventure in Los Angeles but I never had a desire to talk to anyone. But I did want to just say hi to Mr. Rogen and talk about what he reads (X-Men, Batman, Preacher) and snap a photo with my crappy cellphone. Yeah, I’m gonna blame the sugar on this lack of judgment. Coolio. I’m mentioned in USA Today’s Pop Candy about my run-in with Mr. Rogen. That sounds like a fun trip – and you discovered a new cupcake shop, AND ran into Seth Rogan, AND got a mention in Pop Candy. How fabulous! Congrats on the Pop Candy celebrity! I'm betting you made Seth Rogan's day. And thanks for the cupcake recommend. I have a study session tomorrow nearby and I think I just discovered what snack I will be contributing… And Kate's cool points just went through the stratosphere. OMG! I was just going to say, "Someone on Pop Candy had a run in with Seth Rogan at that comic book store, too!" I should have known that the Darlene was YOU! And next time you need to give justJENN and I some notice so we can meet up! Awww… Work that geek cuteness! I go to that comic shop too. I have never been to Dainties, though.